An ear infection is an inflammation of the middle ear caused by bacteria or viruses. It occurs when fluid builds up behind the eardrum. Anyone can get an ear infection, but children get them more often than adults. Three out of four children will have at least one ear infection by their third birthday. In fact, ear infections are the most common reason parents bring their child to a doctor. The scientific name for an ear infection is otitis media (OM). 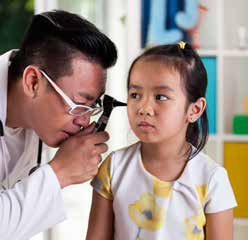 If your child isn’t old enough to say “my ear hurts,” here are a few things to look for: Tugging or pulling at the ear(s), fussiness and crying, trouble sleeping, fever, fluid draining from the ear, balance problems, or trouble hearing. Most ear infections are viral and will get better on their own. Your doctor can determine if treatment is needed. Ear pain can be treated with over-the-counter pain relievers or with a warm, dry compress on the ear.